The M.V. 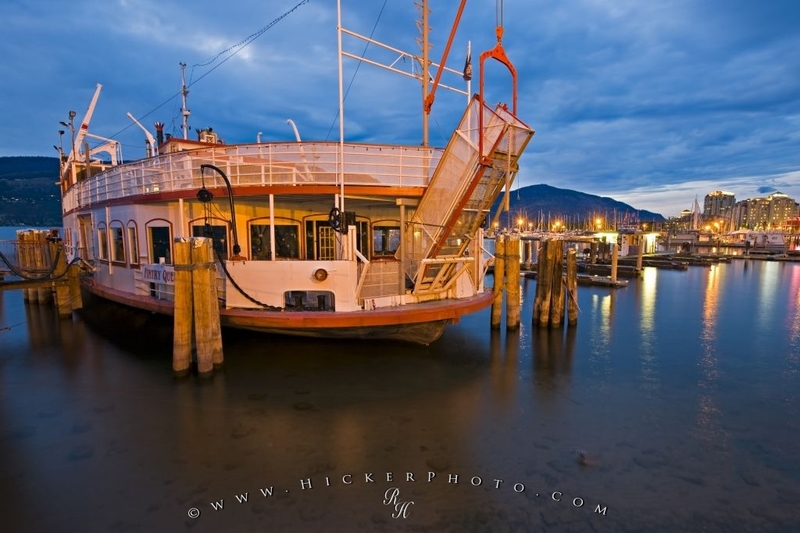 Fintry Queen is a popular tourist attraction and cruise tour which transports passengers to various interesting locations on Okanagan Lake in British Columbia, Canada. The M.V. Fintry Queen is docked at the Kelowna Marina in Okanagan Lake at the foot of Queensway in Kelowna in the Okanagan Valley, British Columbia, Canada. From 1948 to 1958, the Fintry Queen was a paddle wheel driven ferry that plied the waters of Okanagan Lake between Kelowna and Westbank. Now converted to a floating pleasure entertainment craft, it takes tourists on tours of Okanagan Lake and for dinner cruises and dances. It can also be hired for private functions and offers facilities for many venues with Barbeques on board the upper deck, fine dining room, regular scheduled entertainment and scenic views of the Okanagan Valley from Okanagan Lake. M.V. Fintry Queen Tour boat along the waterfront of Okanagan Lake in the city of Kelowna, Okanagan, British Columbia, Canada. Photo of the M.V. Fintry Queen a tourist attraction docked at the marina in Kelowna on Okanagan Lake, British Columbia, Canada.